Swim is a creative leadership consultancy; we design programs that give ambitious people tools and insights to have maximum impact. Janet Kestin and Nancy Vonk have seen it all. 13 years as Co-Chief Creative Officers of Ogilvy & Mather Toronto was a wild ride, packed with lessons that shape their creative leadership lab. The team who delivered world-beating results for global brands like Unilever and Kraft, who have mentoring and teaching skills that turned even summer interns into international superstars, approach leadership training a little differently. Well, a lot differently. Talented people tapped for senior roles often lack leadership skills vital to the success of their team. The cost: poor results, losing good people, losing business. Companies with women in leadership roles are more profitable. But many of those well-poised to step into senior jobs get off the up escalator before reaching their potential. Businesses that approach problem solving without creativity on their side can’t compete. Companies in any industry that want to help employees to lead teams effectively. Individuals and groups in top roles looking for new tools and strategies to achieve their goals, and get the best from their people. Companies that want their “under 30s” to contribute more effectively, sooner. Companies that want to enable more of their women to step into senior roles. Companies that want to bring more creativity to problem-solving. Every program is customized to address specific needs. Swim uses an experiential approach to learning designed to have lasting impact on individuals and groups. Every program is customized to address specific needs. Participants go forward as creative leaders with holistic perspective. They have new ways to galvanize teams around them and develop leadership in others. They connect more deeply to the role relationships play in achieving their goals. They acquire tools for looking at systems and processes that don’t work, and techniques for rethinking them. They bring big ambition to problem solving, have greater power to persuade, and strategies to navigate through conflict. They leverage the power of their own authenticity. The Moth The preeminent storytelling group based in New York. Larry Flanagan Executive Dean of the Business School at New Haven University, and former CMO of Mastercard. Tim Dixon Managing director, Purpose Europe; was head speechwriter to Julia Gillard and Kevin Rudd, former Prime Ministers of Australia. Alan Webber Co-Founder of Fast Company. Mick Ebeling Founder of Not Impossible Labs, behind Project Daniel and the Eyewriter, one of Time's Top 50 Inventions of 2010; author of Not Impossible. Kyle MacDonald Who famously traded a red paper clip for a house. Arthur Fleischmann Who has published a book with his daugher, Carly, a globally recognized advocate and voice for autism. Carne Ross British ex-diplomat who negotiated the separation of South Sudan and whose book, The Leaderless Revolution, was the bible for the Occupy movement. Rick Boyko Former Co-President and CCO of Ogilvy & Mather North America, and Director of VCU Brandcenter. Laurie Brown Passionate advocate for Canadian music; host of The Pulse on CBC2. An awarded interviewer, author and documentary film maker. Kelly Lovell This 22-year-old CEO is an advisor to global corporations and government leaders on leveraging the power of Millennials and Gen Z.
Katie Higginbottom Harvard-educated PhD candidate with research-based strategies for overcoming women’s barriers to success. I will never forget my Swim, it will stay with me the rest of my life. I wish Swim had been around when I got my first job as a creative director. You’d think that whatever you did as a writer or art director to earn you the promotion would be enough to qualify you for this new role, but the reality is, it’s a totally different job, with, in some cases, a requirement for the exact opposite in skill set. I heard the noise all the way from New York! They ate it up in Montreal. We’ll have to do more of this. Two of the best at focusing creativity, while simultaneously releasing it from the boundaries of the status quo. Swim is unique, it's highly inventive and it's really important. Janet and Nancy deliver lessons critical to success in highly impactful ways. They have insight that can only come from years of experience with creatives, marketers and agencies, and deep understanding of crafting work inside complex teams that are both global and local. Individuals come away with practical tools they can use in their next meeting and for the rest of their careers. I got more out of one hour at Swim than a week at Cannes. Prepare to step out of your comfort zone. Like, way out. Janet and Nancy will introduce you to experts across a diverse set of disciplines who will cheerfully break you down, only to build you up and make you a better leader than you thought possible. We are all faced with “sink or swim” situations in our careers, SWIM has provided me with the tools necessary to…well, swim. It is incredibly inspiring to hear from two successful women who have real stories and lessons to share that are so applicable to many. I loved the fact that many of our younger people came who have yet to have families. It will be this generation that needs to instil the way they approach work not as ground breaking, but as the expected way of operating. Swim has made quite a splash. 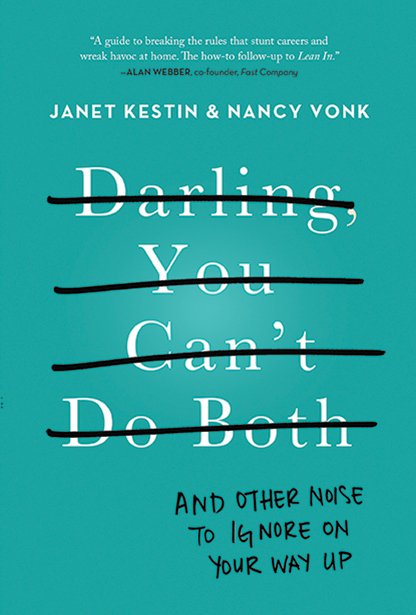 Darling, You Can't Do Both (And Other Noise To Ignore On Your Way Up) is hot off the HarperCollins press. Darling, You Can’t Do Both is a guide for women in any industry, at any stage of their careers, who find themselves hitting walls in pursuit of their goals. We want you to see, and start breaking, the invisible rules of business that trip up all of us. Darling will give readers new perspectives, ideas and tools for rewarding, sustainable careers. Janet and Nancy are available for events through The National Speaker's Bureau. Janet and Nancy are a speaking powerhouse. Their presentations provide insight and humour in equal doses, that stick in your mind. The first time I saw them speak I was so inspired that I pitched them on writing a book—which I’m proud to be publishing. I couldn’t recommend working with Janet and Nancy more highly.